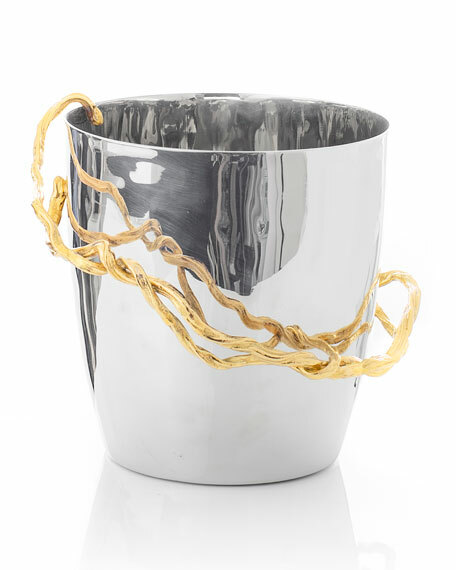 Handcrafted stainless steel champagne bucket. 10.5"W x 8.5"D x 8.5"T.
The Wisteria Gold collection is inspired by the beauty of twisted and curving vines. Vines have been a favorite motif of Aram's over the years, since he sees them as a symbol of love and togetherness. As they grow, they loop together and separate, accommodating and allowing for whatever falls in their path. The gracefully intertwine while maintaining their own individuality. "I think of vines as a symbol of love when I see how they grow together, with grace, strength, and vitality."